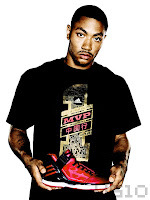 Katherine Dunham is not a name that would typically surface in conversations about basketball, but after watching the Chicago Bulls vs. L.A. Lakers game (aired on 12/25/11), I discovered that she and Chicago Bulls player, Derrick Rose had a few things in common. Dunham and Rose are natives of Chicago’s Southside and have characterized aesthetic movements and elements of Chicago life in both fashion and performance. The continuities between Dunham’s stage performances and Rose’s court performances can be found in Chicagoan themes in their wardrobe. Here, the uniform and/or costume, is just as much a part of the performance as body consciousness, control, and movement across the court or stage is. 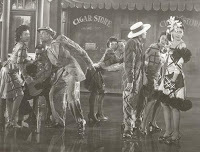 In 1943, Katherine Dunham and her Dancers appeared in the film Stormy Weather where their costumes, set designs (by John Pratt), and their social “slow dance” movements in this first sequence can be read as a scene depicting life in Chicago’s Southside or “Black Belt” community in the 1920s. VéVé Clark stated that "Their style is meant to be mimetic… suggest a reality of the Chicago streets. The angular lines in the costumes reflect the reticulations of the elevated train tracks above, under which this disparate group has huddled" (Clark, Kaiso! p. 329). Even the details of Dunham’s shoes have lines that move around the shoe. 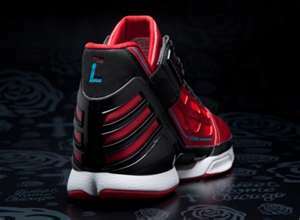 The “AdiZero Rose 2 collection for Adidas has Chicago written all over it,” said Georgia Garvey of the Chicago Tribune. In his first game of the season, Derrick Rose’s new shoe was one of the attractions of the game. A part of his shoe line, the “Windy City,” bears the same colors of the Chicago Bulls uniform (black, red, and white) and pays homage to Chicago with a blue “L” on the back of the heel, which signifies the city’s blue-line “L” train as well as other angular designs that “mimic the look of the CTA train car,” said Garvey. In both examples, aesthetic attire has and continues to be a method used to accentuate individual body parts, such as the feet, and entire bodies in motion. Thus, in dance and sports, any given move or technique can be rhythmic, mimetic, or influenced by things one has learned or has come into contact with in his/her daily environs. Reading the body and material culture as a text often provides examples of how individual memory is able to help shape our understanding of history and culture, from lived experiences as well as those experiences figurative and imagined. Clark, VéVé. “Performing the Memory of Difference in Afro-Caribbean Dance: Katherine Dunham’s Choreography, 1938-87.” In Kaiso! Writing By and About Katherine Dunham, eds. VéVé Clark and Sara E. Johnson, 320-37. Madison: The University of Wisconsin Press, 2005.